1985-1986. Site planning competition for the Prinsen precinct at Stora Torget in Motala. 1990-1993. Design and production of 55 apartments, shops and a parking garage. The competition proposal called for the preservation of a market-hall and a cafe/bakery building on the site. In this way, the new buildings became more like large inserted fragments rather than a completely new city block building complex. The courtyard has contact with the streets via alleyways and portals, not unlike the character of a small town. The street facades face different urban spaces, and are varied accordingly. Towards the interior of the block, the buildings open out with stairwells, balconies, and terraces. The narrow buildings have generous entrance halls and bedrooms towards the courtyard, and in all apartments the greatest possible circulation between the apartment rooms has been sought. 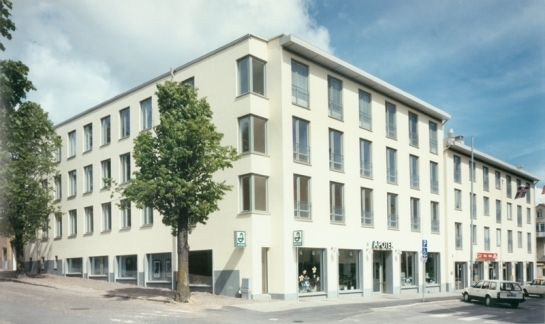 The corner building towards the square has french windows and an interior room height of 2.65 m.
Arkitektur No. 4, Stockholm, May / June 1995. MAMA No. 8, Stockholm 1994.